Last Sunday, Hue Jackson claimed “everything has got to be perfect” for the Cleveland Browns to win a game. Such a comment forced you to ask if this was a small slip of the tongue, or was trouble brewing within the team facility? It took less than a day for us to find out it was the latter. Things are bleak between those charged with fixing the Browns off the field and on it, and thanks to a trade Cleveland wasn’t involved with, we may have just hit the point of no return. If you missed it last night, New England Patriots backup QB Jimmy Garoppolo was traded to the San Francisco 49ers. If the name sounds familiar to Cleveland fans, its because Garoppolo was a popular offseason target for the Browns. What prevented said deal, it seemed, was the Patriots’ high asking price. With the same player now being acquired for just a second round pick, you wouldn’t be wrong to wonder why Cleveland couldn’t meet this price. You also wouldn’t be alone in wondering this. Per Benjamin Allbright, the Browns’ coaching staff was apparently “highly” upset with the front office once the news broke. It was reportedly seen as more evidence the team’s higher ups are undercutting Cleveland’s chances of winning. While we’ve seen plenty of proof pile up for this argument over the past year and a half, the inactivity in the Garoppolo talks looks like it’s the last straw. It certainly wasn’t the first. You don’t have to look far when it comes to examples of this front office causing tension with Jackson’s crew. For one, it’s difficult to believe anyone can tune out the noise when it comes to how well players like Carson Wentz and Deshaun Watson are performing. The team’s lack of a stable quarterback has made winning near impossible, and having passed on two great options only makes things worse. Outside of Jackson’s support of Robert Griffin III last year, the quarterback issues can be pinned on the front office. Instead of taking Wentz or Watson, the Browns took Cody Kessler and DeShone Kizer. The former was over-drafted and seemingly forced upon Jackson. The latter was thrown to the wolves this season despite not being ready to start. Of course, quarterback isn’t the only thing the front office is getting wrong. Jackson is essentially working with a receiving corps which would struggle in the CFL. He and his staff have to find a way to score with late round selections and practice squad pickups. Asking Kizer to string together successful drives with the likes of Ricardo Louis and Bryce Treggs is nobody’s recipe for success. Technically, the Browns front office signed an established receiver over the offseason in Kenny Britt. Of course, this has also become a source of tension within the team. All Britt has done since joining Cleveland is drop passes and get sent home for missing curfew. This would be frustrating on its own. However, defensive coordinator Gregg Williams reportedly warned the front office against signing Britt. That the team still did so anyway, now sitting idly by while the wideout causes nothing but headaches only gives the coaches more ammo for accusing the higher ups of undercutting their chances to win. As you can see, the front office has done nothing except pass on talent which could help and acquire players who can’t. While swinging a trade for an eight-game rental of Garoppolo may not have helped matters, it’s hardly surprising that such a development appeared to be a breaking point. Jackson and crew are responsible for winning football games with the team assembled for them. So far, they’re 1-23, and everyone’s seat is practically on fire at this point. Knowing the front office is deliberately avoiding the kinds of moves which could help, the coaching staff is understandably on edge. It’s all proof this was a marriage which was doomed to begin with. 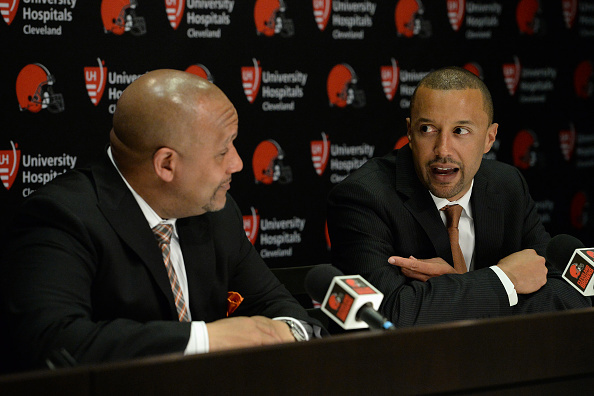 Owner Jimmy Haslam assembled a front office which talked a big game, but had no experience. He then tasked Jackson and company with turning whatever roster he was given into a winner, regardless of its blatant lack of talent. Now, with the coaches reportedly already assuming they’re on the verge of being fired, the frustration about their setup is boiling over. As bad as it looks now, it’s only going to get worse since we still have to get through eight more games. Should the losses pile up (which is a certainty), you better believe the strain is going to increase. As far as the bigger picture goes, the writing appears to be on the wall. This group simply cannot work with each other, with last night’s story acting as further proof of this. It’s no longer a matter of whether or not the front office and coaching staff get another year to work it out, but instead whether or not both get shown the door at season’s end. Of course, in Cleveland, such a situation is just business as usual.